Hey Slugs! As the holiday season approaches us it is always good to reflect on what we are all thankful for. Expressing gratitude has been proven in positive psychology to uplift mood Someone that our Peer Education Program is very thankful for is our Tabling Coordinator, Jorge! So meet our CAPS Student hero this week, Jorge Roque! It is Jorge’s second year with us at CAPS and we do not know what we would do without his kind disposition. Something I do to relieve stress is that I set time aside throughout my days where I do literally nothing. I give myself this time to perform self-care routines as simple as eating, talking with friends, or just listening to music. Something else I do is that on certain weekends I go out to the beach or go hiking, where I disconnect from my phone and just take in all this town has to offer. Something that I am very passionate about is photography. I usually carry my camera out with me when I’m out hiking or at the beaches surrounding the city. I love takin g pictures of things, such as the different paths around campus or even the amazing sunsets! If you could share one thing you would like your peers to know about CAPS, what would it be? 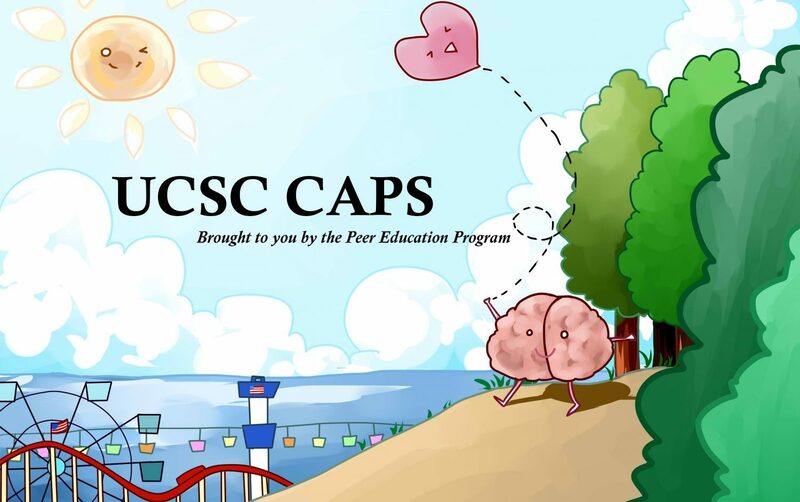 Something I’d like to let my peers know about CAPS is that we’re here to help in any way we can. It may be scary at first to come up to the offices, but there’s people here that want to see you succeed and reach your full potential! Hello Slugs! Can you believe the quarter is almost over? We’re nearly there! Today we’d like to introduce one amazing Peer Educator, Ila. She helps run this blog, among several other PEP duties. Thanks for everything these past couple quarters, Ila! I’ve come to accept that I’m a disorganized person. Unless I make deliberate efforts to stay clean, my desk disappears under a pile of papers and my bed is overwhelmed with a mountain of clothes. My brain is the same way: my anxieties and worries expand and saturate my mental space unless I take action.When I incorporate some gentle structures into my routine to stay organized, I feel calmer and I have more mental clarity. A few “mental hygiene” routines help me focus on the present moment and cordon stressful thoughts to the appropriate time. When I wake up, I start the day by mentally listing 3 things that I’m grateful for as well as my primary intention for that day. Later, I do a few minutes of meditation (I think of this as strength conditioning for my brain). They’re simple rituals, but keeping my life lightly structured helps me from becoming overwhelmed by stressful thoughts. I try to stay as involved as I can with my family’s chocolate-making business, and a lot of my friends and family work in the restaurant industry. Growing up in this environment as turned me into an incurable “foodie”, but I’m also very concerned with the more practical issues surrounding food like sustainability, environmental conservation and food security. Also, I like to dabble in writing, drawing, and playing music. I think I just reached a turning point where I can accept imperfection in these hobbies. Not only does it feel freeing, I think this attitude has actually made me a better artist! I want people to know that they should never feel shame for feeling like they need help with mental health issues. There is far too much stigma surrounding mental health care, and I firmly believe that we should all practice “mental hygiene” and regularly check in on our minds. Most of us automatically brush our teeth twice a day, or apply bandages and antiseptic to cuts and scrapes. I envision a society where we also have habitual practices that serve our mental health. Ila is a fourth year, double majoring in Politics and Psychology, and she is affiliated with Stevenson. Hi everyone! We hope you are all having a great Winter Quarter so far. This week we would like to introduce another amazing PEP member, Chris. Thank you for all your hard work, Chris! To regularly relieve stress, I play video games, take occasional naps, and play the guitar. I feel like doing these activities allows me to escape from the stress of the world and gives me time to recuperate and relax. I love playing my guitar. Taking time to learn new songs and different chords is really cathartic for me. It’s the one thing I always find myself going back to when I have spare time. If you could share one thing you’d like your peers to know about CAPS, what would it be? I would like people to know CAPS is an extremely safe place to go and talk about anything that’s bothering you. Going there doesn’t mean there’s something wrong with you. Many people have gone and received help with stress and various experiences that have been hindering them. Overall, it is worth checking out and I promise they won’t bite! Chris is a third year Intensive Psychology major, affiliated with College Nine. Hey everyone! We hope Winter Quarter is going great so far. Today we’d like to introduce you to another wonderful PEP member, Miriam. She’s been doing great work this year at CAPS. Thank you, Miriam! In order to relieve the stress that arises from life’s daily hassles, I choose to run. Running long distances liberates my mind from worrying about any stress. When I run, my sole focus is on creating a steady rhythm in my breathing, so I immediately begin to coach myself: “inhale with your nose and exhale through your mouth…repeat”. The inhales and exhales parallel with my speed. As I gain momentum, my inhales and exhales occur more rapidly; however at the same time their consistency give me a peace of mind. In this sense, it is ironic that I am able to reach a calm state of mind at a moment when my heart is racing at what seems its quickest pace and pumping my blood like there is no tomorrow. However, I get this amazing feeling when I reach my destination. At this point my breathing is pumping in my ears, but it makes me feel alive, rejuvenated, and accomplished. Over the past 6 years, I have grown passionate about soccer. Throughout these 6 years, I have worked hard to master the game and the mentality that is essential to play it. Although I still have much to learn about the sport, to this day it ceases to amaze me how I have improved. I sincerely believe that without my amazing coaches from high school, I would not be the same player I am today. They taught me dedication, persistence, and the most important virtue: simply being able to enjoy the game. What is awesome is that these characteristics are not only necessary to play soccer, but they are definitely essential for living our lives. Every time I step onto a soccer field, a rush of excitement warms my body as I await the whistle of the referee to begin the game. In my eyes there is an immense beauty to this sport, for most if not all of the power is in our feet and legs. The fact that I can have direction and coordination with my legs is so cool, and as the years have passed I have grown to appreciate my body for the amazing capabilities it has. Also, I love that soccer is universal and that through soccer I have made deeper connections with a variety of people and students in my school, job, and in my home town. In soccer it is known that every game or practice is a chance to get better, and that just reminds me that the same goes for life: every day brings opportunity for change. Miriam is a second year, double majoring in Psychology and LALS. She is affiliated with Oakes.